iXperience is an accredited study-abroad career accelerator program for university students based in Cape Town, Lisbon, Tel Aviv, and Berlin, in partnership with the University of Virginia. iXperience offers a 6-week iX Accelerate course and a 10-week iX Immerse course which combine blended learning courses with interning experiences taught by industry experts in Full Stack Coding, Data Science, Digital Design, Blockchain for Business, Product Management, Virtual Reality, Management Consulting, or Investment Finance. The 10-week iX Immerse program includes 4 weeks of learning about the local history and culture, followed by a 6-week career-focused course and internship which includes intensive classwork and practical work experience. The 6-week iX Accelerate program includes a 2-week intense technology bootcamp, followed by 4-weeks of work experience at a local company, with support from teaching staff. Class sizes are limited to 25 students with help from hands-on teaching assistants to ensure that complex concepts are grasped. Outside of class, students can explore their host city, with planned excursions like food tours, surfing, diving, hiking, sailing, and cultural immersions. Modern accommodation is provided and located near vibrant restaurants, cafes and public transport. During the internship portion of the course, students produce tangible work to showcase to future employers, boosting their resumes as a prospective employee. Past partners have included Uber, Accenture, Deloitte, and Barclays. iXperience also assists students in helping them structure their CVs, online presence, and interviewing skills, so that they have an edge in an extremely competitive job market. Upon graduation, students join a large network of more than 1000 alumni, dedicated to pursuing personal and professional growth. Many graduates now work for global big tech and finance companies. Students are not required to have prior experience to apply, but must be current university students with a GPA of 2.75 or higher. To apply, applicants fill out an online form and answer essay questions to tell iXperience about themselves, then choose their subjects for the course and internship. In some cases, iXperience will conduct phone interviews with students. The blockchain is "broadly applicable, highly disruptive", and could shape our future as much as AI or the Internet. We'll prep you to harness the potential of the underlying technology. You might have a friend who's made a quick buck off of Bitcoin or another cryptocurrency—you might have even done it yourself. While there might be a lot of hype around Bitcoin, the potential for the blockchain and its applications goes far beyond trading. This course will teach you to cut through the noise and understand the underlying technology. You'll learn not only how to trade coins in a savvy way, but about the economics, markets, principles, business models, use cases and technologies in Blockchain and cryptocurrencies! Admissions at iXperience is merit-based and need-blind, but your eligibility for financial aid is determined entirely by your demonstrated need. During your application you will need to select if you are applying for financial aid and you will then have to complete a separate application to be eligible. Financial aid packages can be up to 30% of your summer tuition fee depending on your needs. Applying for financial aid will not impact your admissions decision in any way. Learn to find, organize, and make sense of the numbers and letters that move the world. The Data Science career is anyone with a hunger for solving problems rigorously and analytically. If you love uncovering hidden patterns and discovering surprising associations, this is the career for you. And you'll be rewarded well—data scientists are amongst the highest paid technical professionals today. After your course, you'll be placed into an internship with one of our partner companies to hone your skillset, bolster your resume, and jumpstart your career. Learn to bring any brand or product to life through graphics, visuals, photography, and videography. Courses blend foundation theory with practical skills. After two weeks of training, you'll be matched with a local company and tasked to work on one of their projects. This gives you a taste of professional life—as well as concrete deliverables you can add to your resume to show future employers. You'll still have class and plenty of support from your teaching staff, who'll serve as guides as you navigate your internship project. More than that, you’ll be immersed in Europe’s spunkiest city, Berlin. A hotbed of entrepreneurial activity, Berlin is known for its youthful energy, and relatively low cost of living. We're forging partnerships with many of those companies to provide you with world-class international internships. Internal scholarships are available. Alternatively, please contact your study abroad office for more options. Learn about web architecture and deploy your creations live to the Internet. We'll teach you to build your own web app from scratch, from the user interface to the database. Full-Stack Web Development is the most popular developer occupation today, according to the Stack Overflow 2016 Developer Survey. The profession and the community around it are thriving and re-inventing themselves continually. If you love being on the cutting edge, this is the career for you. After your course, you'll be placed into an internship with one of our partner companies to hone your skillset, bolster your resume, and jumpstart your career. Product managers are the glue that hold teams together, their guiding light, the wind at their backs. Learn to envision the future, craft actionable plans, and ship game-changing products to market. PMs prototype new apps and websites and collect user feedback, interview users and analyze insights, design business models and create go-to-market strategies. Beyond these essentials, PMs have the flexibility to play to their strengths, whether that's in tech, business, or design. Most of all, PMs are exceptional communicators: they align engineers, designers, investors, users, and manager behind a shared vision and drive the team to execute and deliver. Learn to envision the future, craft actionable plans, and ship game-changing products to market. Then apply your skills in a hands-on internship and boost your career and resume with real-world experience. Master the technology to create compelling virtual environments that will redefine the way we work, play, and socialize. Virtual Reality (and related Augmented Reality) is a whole new medium, the first for over a generation. It transports you, to real or imagined places, and allows you to connect to people and characters on an emotional level. VR has become a popular job market for engineers, artists, designers, educators, and more. It’s the perfect job someone who wants a position at the frontline of technological innovation. We’re on the cusp of a virtual reality revolution (yes, even beyond Pokemon Go), and you won’t want to miss out. After a 2-week intensive course, you'll be placed in an internship with a top company, where you can flex your skills, earn real experience and boost your career and resume! So you’ve probably heard that Blockchain is taking over the world, but what is Blockchain? And how can you become a Blockchain developer? 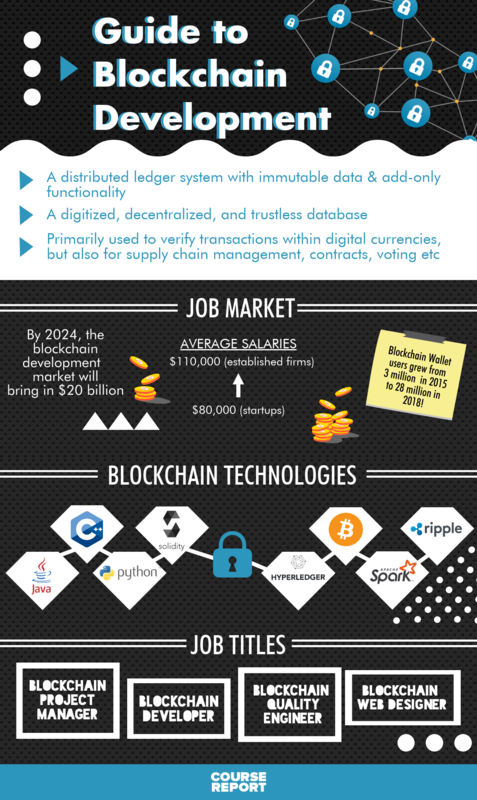 In this guide we look at the definition of blockchain, the growth of the blockchain industry, what sort of jobs exist in blockchain, how much you can earn on a blockchain salary, and which skills you’ll learn to become a blockchain developer. Plus, our picks for the best blockchain bootcamps, and coding bootcamps which cover blockchain in their curriculum. Accommodation is included. iXperience partners with accommodation providers in trendy locations with facilities like self-service kitchens, washing facilities, or beautiful views. Students share rooms with iXperience students of the same gender. Any other information you'd like to share with iXperience Admissions Team from iXperience? By submitting, I acknowledge that my information will be shared with iXperience. An email with these details has been sent to iXperience. You've already applied to this scholarship with iXperience.